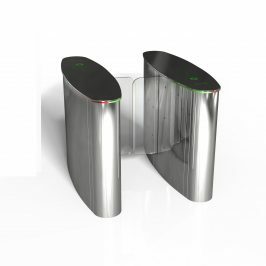 This optical turnstile is suited to spaces like banks or corporate headquarters where aesthetic excellence is a priority for visitors. Optical Turnstiles offer architects and interior designers many options to customize and create a rich and opulent look. POWER SUPPLY 110 VAC, 3W minimum (at standby), 50W max. POWER LOSS In the case of a power loss, the gate assumes an open or closed position, depending on the user setting. In emergencies, the gate opens automatically. SPEED Opens in 1 second. Closes in 1 second.